And there appeared to them parted tongues as it were of fire, and it sat upon every one of them: And they were all filled with the Holy Ghost, and they began to speak with divers tongues, according as the Holy Ghost gave them to speak. 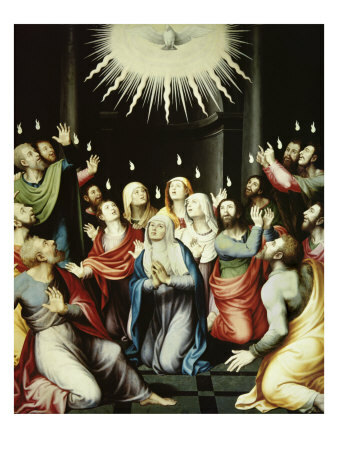 The Holy Spirit appeared under the form of tongues of fire in order to fill the Apostles with truth and to prepare them to bear witness to Jesus. He also come to fill their hearts with love. He is the Person of Love in the life of God. He is also like a breath, an aspiration of infinite Love, from which we draw the breath of life. On the day of Pentecost the Divine Spirit communicated such an abundance of life to the whole Church that to symbolize it "there came a sound from heaven, as of a violent wind coming, and it filled the whole house where they (the Apostles) were sitting." But it is also for us that the Holy Spirit has come, for the group in the Cenacle represented the whole Church. The Holy Spirit came to remain with the Church forever. This is the promise of Jesus Himself. He dwells in the Church permanently and unfailingly, performing in it without ceasing, His action of life-giving and sanctification. He establishes the Church infallibly in the truth. It is He Who makes the Church blossom forth with a marvelous supernatural fruitfulness, for He brings to life and full fruition in Virgins, Martyrs, Confessors, those heroic virtues which are one of the marks of true sanctity.